The latest on what has been agreed in Aleppo and an exploration of Iran's involvement in the Syrian conflict. The US confirms it will stop some arms sales to Saudi Arabia. We get the latest on what has been agreed and explore Iran's involvement in the Syrian conflict. The US confirms it will stop some arms sales to Saudi Arabia following hundreds of civilian deaths as a result of coalition strikes in Yemen - we hear why some British MPs believe the UK should follow suit. And a miracle baby for a woman who's given birth after doctors restored her fertility using ovarian tissue removed and frozen when she was a young girl. 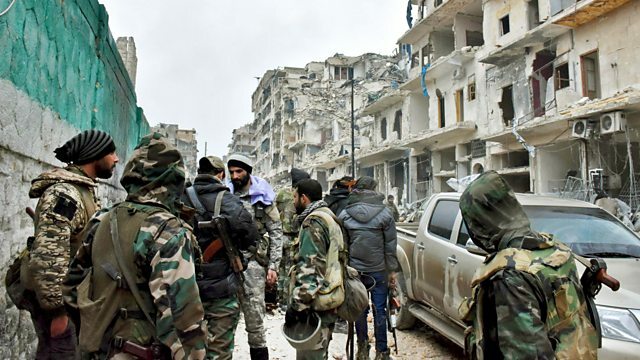 Picture: Rebel fighters in Aleppo Credit: Getty.